The Solar Revolution The Light Revolver for the next millennium!!! 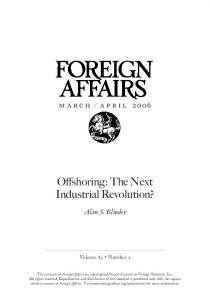 Offshoring: The Next Industrial Revolution? The Next Revolution In Martial Arts Schools! The Solar Revolution The Light Revolver for the next millennium!!! Congratulations! You have purchased the most state of the art, high performance, circular light revolver ever offered to our industry; the Solar Revolution. STOP: Before assembling or turning on the motor please read and heed all instructions DO NOT TURN THE MOTOR ON BEFORE READING THESE INSTRUCTIONS The unit is positioned at the factory to enable accurate and safe installation. Turning the motor on before installation will disrupt proper positioning for reliable operation. The Solar Revolution kit includes the following hardware: 1 Solar Revolution motor drive mechanism. General installation tips and guidelines: ☺ If you read anything in this manual read this!! ☺ Be sure that the Solar Revolution is fastened to framing members and or joists in the ceiling of your green house or grow room. Ensure that the motor drive mechanism is level. When using multiple reflectors, please follow these general guidelines: Never use one reflector; only use pairs of reflectors. Each reflector assembly should weigh about the same If the reflectors are of different brands, place reflectors of similar size on apposing arms to promote balance and uniform light delivery If reflectors require glass ensure opposing reflectors each have glass to ensure a balanced load. This unit is not compatible with reflectors that have on board ballasts. This unit is only compatible with remote mount ballasts lighting systems When hanging four reflectors, hang two reflectors closer to the center while the other opposing pair are positioned farther from the center to optimize light uniformity. Do not exceed more than 30 pounds per arm when using multiple lights. Total weight should not exceed 120 pounds. Always mount heavier reflectors towards the center while hanging lighter reflectors further from the center. When hanging more than four reflectors, ensure that you choose reflectors made from aluminum to minimize weight load. Multiple smaller wattage lighting systems are preferred over fewer larger wattage reflectors. For example: Six 400 Watt lights provide better light uniformity than four 600 Watt lights while at the same time, both configurations provide the same watts per square foot. Use the 180 degree motor drive mechanism when two or three reflectors are required. Use the 90 degree motor drive mechanism when more than four reflectors are required. Make sure enough clearance exists to allow full rotations without obstructions Make sure no lamp cords impede full rotation distance. When installing the lamp cords, ensure enough slack is included to move the lamps up and down. Assume that you will use 10 feet of a 15 foot lamp cord to wire and dress it properly. Some lamp cords are stiff if fresh from the box. Use a hair dryer to heat the lamp cord and to straighten the kinks. Label the reflector and ballast with corresponding letters or numbers to assist in identification later on. For best results and optimum flexibility we recommend the West Coast Growers Grow Stand while of course all wiring can be fastened to a ceiling or rafters as well. Be sure there are no obstructions or tangles that prevent the revolver from moving freely. Wiring instructions: The Solar revolution is set to a mid position when it is shipped from the factory. It is important to drape each lamp cords to the left of the arm so when the mechanism is turned on, the arms will begin to move away from the lamp cord. This will prevent long term lamp cord damage. Connect end of cable to the ballast output recepticle. 110V AC power receptacle: Once all the lamps are in place on the ARMs and all lamp cords are properly tie wrapped, plug the AC power cord into the Solar Revolution. Then plug the power cord into a timer or 110V wall receptacle. The Solar revolution will now begin to turn the lights. Watch several rotations to ensure no obstructions or wire snagging exists. Adjusting the rotation for your Solar Revolution The Solar Revolution comes factory preset in the “HOME” position and will rotate 90 degrees clockwise and counter clockwise when left in this configuration. To change the rotation, first remove the porthole covers to gain access to the limit screws. Then ensure that the motor is in the home position as seen in the previous diagram. ONLY WHEN THE RED PORTION OF THE TRIGGER WHEEL IS SEEN IN THE “RIGHT-HAND” PORTHOLE COVER CAN THE ROTATION ADJUSTMENT BE RELIABLY ADJUSTED. If the trigger wheel is not in the home position simply plug in the rotator and allow it to run until the red portion is observed in the RIGHT-hand porthole adjacent to the motor. For 355 degree rotation simply remove the limit screw from the home position. Note: use a magnetized Phillips head screw-driver to remove or change the limit screw. This will ensure that the limit screw can be removed or installed without dropping it into the assembly. Tissue paper put over the head of the Phillips head screw driver will also ensure that the trigger screw will not fall off of the tip of the screw driver. You are now ready to enjoy even canopy growth and even better yields….Congratulations!!! Limited Warranty West Coast Growers (company) warrants to the original purchaser that said product (Solar revolution) will be free from defects in workmanship and materials for a period of two (2) years, one (1) year on drive motors from the date of purchase. If there is a perceived problem with the Solar Revolution, contact West Coast Growers (888) 924-4769 with a description of the problem. If necessary, West Coast Growers will issue an RMA # (Return Material Authorization Number). Once received, West Coast Growers will inspect the unit and repair or replace any defective component. West Coast Growers reserves the right to refuse service if the unit has been opened, misused, damaged or modified in any way. If sending the unit, the customer is responsible for initial; postage and West Coast Growers will cover the postage back within the continental United States. Under no circumstances will West Coast Growers accept warranty work without the RMA# printed clearly on the OUTSIDE of the box. If there is a failure, please contact West Coast Growers prior to sending. Limitations: Implied warranties, include those of fitness for a particular purpose and merchantability ( an in unwritten warranty that the product is fit for ordinary use, are limited to two (2) years from date of purchase on workmanship and materials, 0ne (1) year on the drive motor. We will not pay for loss of time, inconvenience, loss of use of your Solar revolution or property damage caused by your Solar Revolution or it’s failure to work, or any other incidental or consequential damages. Some states do not allow limitations on how long an implied warranty lasts or exclusion or limitation of incidental or consequential damages, so the above exclusion or limitations may not apply to you. Report "The Solar Revolution The Light Revolver for the next millennium!!!"